* The share price is the closing price on December 12. The number of shares issued was obtained by subtracting the number of treasury shares from the number of outstanding shares as of the end of the latest quarter. This Bridge Report outlines the results of ITO EN for the first half of the fiscal year ending Apr. 2018 and the outlook for the term ending Apr. 2018. The business of ITO EN is classified into the Tea Leaves and Beverages Business, which manufactures and sells tea leaves and beverages, the Restaurant Business, in which Tully's Coffee Japan Co., Ltd. operates specialty coffee shops and FC business, and The Others, in which Mason Distributors, Inc. (Florida, the U.S.) manufactures and sells supplements. For the term ended Apr. 2017, the sales of ITO EN (non-consolidated) accounted for 84.5% of the Tea Leaves and Beverages Business (78.1% of consolidated sales). As for the composition of non-consolidated sales, tea leaves make up 9.1%, beverages 90.0%, and others 0.9%. 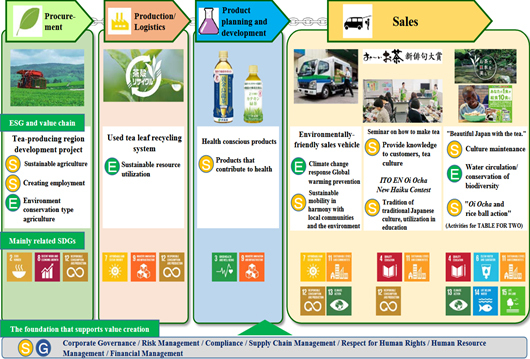 One characteristic of the ITO EN business is that each step of the business flow (Procurement ⇒ Production/Logistics ⇒ Product planning and Development ⇒ Sales) satisfies ESG principles. In Procurement, the company is engaged in the Tea-Producing Regions Development Project in order to ensure the stable procurement of high-quality tea leaves. This activity is linked to sustainable agriculture (S), creating employment (S), and environment conservation type agriculture (E). In Production/Logistics, the sustainable resource utilization (E) is accomplished by Used Tea Leaves Recycling System. The company recycles the post-production waste left by used tea leaves into products such as fertilizer and animal feed, as well as boards, resin, paper products, and building materials. In Product planning and Development, the company is focused on developing products that contribute to health (S), such as its health-conscious "Golden Oolong Tea" and "Catechin Green Tea." The company is also continuing ESG efforts in Sales. The company is tackling climate change response and global warming prevention (E), as well as introducing an Environmentally-friendly sales vehicle accounting for sustainable mobility in harmony with local communities and the environment (S). The company also provide knowledge to customers, tea culture through "How to brew tea" seminars (S) and passes along traditional Japanese culture and utilize for education by the "ITO EN Oi Ocha New Haiku Contest" (S). In addition, the company further promotes its activities in the fields of culture preservation (S), environment conservation (E), and water circulation/conservation of biodiversity (E) via the "Making Japan Beautiful Through the Tea." campaign. It also teams up with the "TABLE FOR TWO" for the "Oi Ocha and Onigiri (Rice ball) Action" (S). In Japan, the number of agricultural workers has decreased due to the aging population and lack of successors, and the number of abandoned fields is growing, while the land used for tea farms continues to shrink. Furthermore, as many as 30% of tea farms are more than 30 years old. To address these problems, ITO EN initiated the tea-producing regions development project in order to contribute to the community by making use of abandoned farmland, training the next generation of agricultural workers, and creating jobs; and to secure a stable procurement of higher quality ingredients for tea. The Tea-Producing Regions Development Project is based on two pillars: "Contract Cultivation with Tea Farmers," and "The Large-Scale New Tea Farm Business," which nurtures tea producers and develops abandoned cultivated lands into tea farms. Contract cultivation with tea farmers has continued since the 1970s; ITO EN signs contracts with tea farmers, agreeing to buy all of the tea farmers' tea leaves, and in turn ITO EN's agricultural technologies department guides the tea farmers in cultivating tea farms, starting with the selection of seedlings and showing farmers how to manage the farms at a low cost using mechanization and the introduction of IT. The second pillar, the large-scale new tea farm business, was initiated in 2001 and utilizes abandoned cultivated lands throughout Japan to train producers who are just entering the tea cultivation business. The development of tea farms and production of tea leaves are mainly handled by local authorities and businesses, and ITO EN buys all the tea leaves that are produced, while fully providing technology and know-how, much like in contract cultivation with tea farmers. In Kyushu, there are many flatlands that are suitable for mechanized large-scale cultivation, and the working hours at some plantations are reportedly less than 1/3 of those in Shizuoka. Contract cultivation for Tencha (an ingredient used in Matcha, a powdered green tea) in areas such as Kyoto and Kagoshima prefecture is also currently in full-scale deployment. ITO EN Matcha is characteristically fresh, with a vibrant green color and rich flavor. This high quality Matcha is made from unique processing techniques and has a wide variety of uses. In the term ending Apr. 2018, the company launched "The Large-Scale New Tea Farm Business" in Saga Prefecture (the fifth target prefecture after Oita, Nagasaki, Miyazaki, and Kagoshima). The company is supporting the operation of tea farms and crude tea production factories by utilizing agricultural corporations established by transportation and warehousing companies. In addition to passing along how to enjoy tea, the company is proceeding with a branch store strategy with sales expansion and a value increase for ITO EN tea in mind. As part of this, in September 2017, Nihombashi "Wa-no-Cha" ITO EN was opened at the Nihombashi Mitsukoshi Main Store, Tokyo, on the Main Building B1 floor along with other foodstuffs. This shop is stocked with tea leaves carefully selected by tea farmers, including rare tea leaves (green, black, and oolong teas) from all over Japan, and each tea comes from a single origin (one type/one producer). It also carries carefully selected, domestically produced dried fruits and herbs to compliment the tea. The shop is directly managed and was opened with the intention of allowing customers to experience traditional Japanese tea culture. Also, in November 2017, the company opened "Ueno saryo ITO EN," a Japanese cafe which passes along traditional Japanese style to customers through tea. The cafe is located inside the Matsuzakaya Ueno, Tokyo, on Ueno Frontier Tower B1 floor. Customers can enjoy drinks, etc. made from tea leaves from ITO EN's specialty tea shops, including "Matcha with Sweets" and "Matcha Anmitsu Soft Serve" (Matcha ice cream with red bean jam and sweet syrup), which uses the same Matcha served in actual tea ceremonies. Furthermore, in June 2017, the company opened "Le monde du thé": (The World of Tea) in the first basement of the Daimaru Kobe, Hyogo. In addition to Japanese tea, the shop also carries teas such as black tea, Chinese tea, and non-caffeinated tea, and boasts a lineup of around 100 different types of tea. Included in the lineup is a brand of black tea, "Thé Ladurée" (Ladurée Tea), from long-established Parisian patisserie "Ladurée." Sales and operating income grew 3.0% and 1.2%, respectively, year on year. In the Japanese beverage market in the first half, sales were healthy in the first quarter (May to Jul. ), while sales in Aug. and Oct. dropped year on year due to typhoons and lingering rain, degrading the performance in the second quarter (Aug. to Oct.). As for the results in each category, tea, vegetable, and fruit beverages sold well, while the performance of mineral water, sports drink, coffee, etc. was not good. The domestic sales of ITO EN followed the trend of the Japanese beverage market, but quantity sold exceeded the market average. The sales of the ITO EN group, including overseas subsidiaries, increased 3.0% year on year to 265,883 million yen. The sales of ITO EN (non-consolidated) grew 1.7% year on year to 208,338 million yen. The sales of tea leaves increased 7.8% year on year, thanks to the effects of nationwide demonstration sale titled "Dai-Cha-Kai" (demonstration sales and tasting events of green tea), events featuring "Japanese Green Tea Day" on Oct. 1, etc. and the sales of drinks rose 1.1% year on year as the company concentrated on the four major brands. The sales of other products rose 11.3% year on year as the performance of powdered Aojiru (mainly made from Kale or Barley Grass) was good. As for the breakdown of the results of drinks, the sales of Japanese Tea/Healthy Tea increased 0.4% year on year, as the sales of "Oi Ocha" rose 3.1% year on year; the sales of Chinese Tea, mainly "Jasmine Tea," grew 4.2%; the sales of vegetable beverages increased 7.3%, due to the growth of "Aojiru" (Green Juice) (up 9.3%) and "Riso-no Tomato" (Tomato Juice) (up 60.3%); the sales of Fruit beverages increased 11.8% year on year; and the sales of "TULLY'S COFFEE" increased 2.3% year on year (the total sales of coffee dropped 2.1% due to the sluggish sales of "W Coffee," which is mainly sold by vending machines.) As for the performance of Domestic Subsidiaries, the sales of Tully's Coffee Japan Co., Ltd. increased 6.6% year on year, but the sales of Chichiyasu Company declined 1.2% year on year due to unfavorable weathers in western Japan, etc. As for the performance Overseas Subsidiaries, the sales of US business, where selling activities got on track, increased 16.2% year on year (9.4% on a dollar basis), and the sales of Other Overseas Subsidiaries grew 24.3% year on year. As for profits, the gross profit rate of ITO EN (non-consolidated) increased 0.8 points to 47.2%, due to the increase in production volume of "Oi Ocha" and the decrease in ingredient and material costs, contributing to the improvement in consolidated gross profit rate. As for SG&A, freight cost grew 8.3% year on year, and advertisement cost augmented 5.5% year on year through the renewal of core products, but the rise in sales commissions was as low as 3.5%, because core products sold well despite unfavorable weathers. The total assets as of the end of the first half were 304,256 million yen, up 1,851 million yen from the end of the previous term. Current ratio was 224.7% (214.1% at the end of the previous term), fixed ratio was 90.2% (94.3% at the end of the previous term), and equity ratio 47.1% (44.8% at the end of the previous term). Operating CF was 11,246 million yen, although it dropped year on year due to the increase in inventory, etc. Investing CF reflected the increase in equipment investment through the switch from the lease of vending machines to the owning of them. Sales and operating income are estimated to grow 3.5% and 3.8% year on year. Sales are estimated to increase 3.5% year on year to 492.5 billion yen. The scale of the Japanese beverage market in 2017 is estimated to be 3,770 billion yen, unchanged from the previous year, and the sales of ITO EN (non-consolidated) are forecasted to grow 2.5% year on year, as the sales of tea leaves and drinks are projected to be healthy in the second half, too. The domestic market share of ITO EN is expected to grow from the fifth largest to the fourth largest. The annual sales of Chichiyasu Company are estimated to increase 2.1% year on year, although the estimated sales have been revised downwardly because of the sluggish performance in the first half. The estimated annual sales of Tully's Coffee Japan Co., Ltd, US business, and Other Overseas Subsidiaries have been revised upwardly. Operating income is forecasted to grow 3.8% year on year to 22.6 billion yen. As the gross profit rate of ITO EN (non-consolidated) will rise due to the sales growth of core products, consolidated gross profit rate is estimated to exceed the initial estimate, but it will be offset by the augmentation of SG&A. The initial estimate of SG&A has not been revised, considering the increases in sales commissions, freight cost, etc. The company plans to invest 11.7 billion yen in equipment (8.1 billion yen in the previous term). A lease depreciation of 7 billion yen (unchanged from the previous term) and a depreciation of 5.9 billion yen (5.4 billion yen in the previous term) are taken into account. According to data collected by ITO EN, the green tea leaf market (Packaged Tea Leaf, Leaf, and Easy-to-Use Tea) is gradually decreasing. In 2013, sales were 250.6 billion yen, but the forecast for 2017 is 233.5 billion yen. However, this decrease is present only in the Packaged Tea Leaf and Leaf markets, which ITO EN is focusing on. The market for Easy-to-Use Tea products such as tea bags and instant tea, which ITO EN has already large market share, is growing. In the first half of this term, the company aimed to raise awareness of Easy-to-Use Green Tea Products brands. Nationwide deployment of the "Dai-Cha-Kai" (demonstration sales and tasting events of green tea) demonstration sales for "Koori Mizu-dashi Ryokucha" (Iced Water Brewed Green Tea) were met with enthusiasm, and the company also televised a single tea-leaf commercial for the first time in 30 years. Events were held for "Japanese Green Tea Day" (Oct. 1) at nationwide retail stores, during which tea leaf sales were up 30% year on year. These initiatives also resulted in a 10% year on year increase in sales for Easy-to-Use products. October 1st is the day when Toyotomi Hideyoshi held a Grand Tea Ceremony in the Kitano Tenmangu Shrine in Kyoto and, at the request of ITO EN, "Japanese Green Tea Day" was officially recognized by the Japanese Memorial Association. The green tea beverage market rapidly expanded between 2003 and 2004 as major beverage manufacturers entered the market one after another, peaking at 447 billion yen in 2005. From 2006 onward, the green tea boom reached a plateau, and while the mineral water boom and sports drink boom (which also acted to ward off heat stroke) continued in its place, the green tea beverage market shrank over the 2006-2010 period. During this time, however, ITO EN steadily raised sales and increased its market share as the top brand. After 2011, the market began to recover, and ITO EN's market share declined slightly, but it still maintained a much greater market share than that of 29% in 2005. In 2016, the market share fell to 33% due to sales offensives accompanying a 2015 product renewal by major alcoholic beverage (beer) manufacturers, but in 2017, the sales offensives lost momentum and the market stabilized once again. "Oi Ocha Koicha" (Dark) was particularly affected while the market share was down. Market share is expected to rise again in 2017. In the term's first half, bad weather conditions made for a rough business environment, but the market share of "Oi Ocha," which recently had its contents, container, and volume revised, increased by 3.1% year on year. Sales volume seems to have increased by nearly 7% year on year for products in 525 and 600 milliliter PET bottles, which also had their containers and volume revised. The "Koori Mizu-dashi Ryokucha" (Iced Water Brewed Green Tea) drink also made a large contribution. As a result, the 2017 green tea beverage market is expected to recover to a scale rivaling that of the 2005 peak, but ITO EN's share is expected to be 34%, far greater than the 29% seen in the previous peak. Although the green tea beverage market is promising, the focus placed on it by major beverage manufacturers (SUNTORY's "Iyemon," Coca-Cola's "Ayataka," KIRIN's "Nama-cha," etc.) make it a tough market. However, even if ITO EN temporarily loses market share due to offensives by these manufacturers, it has always been able to recover the market share in a short period of time. Although there is fierce competition in the green tea beverage market as shown in the graph above, even if there are short-term fluctuations in market share, ITO EN, the market leader, benefits the most from market expansion. Green tea is not the only promising beverage market, but the Hojicha market is also promising, having grown approximately five times larger over the past ten years (2005-2016, data by ITO EN). Hojicha is low in caffeine and is particularly popular among women. Until now, ITO EN has held a monopoly over Hojicha (RTD Roasted Green Tea), but major beverage manufacturers are proceeding with preparations to enter the market. However, due to having expanded in a variety of categories (tea leaves, RTD, powdered tea, etc. ), the ITO EN brand is steadily penetrating the Hojicha market as well. This is seen in the supply of Hojicha powder to FamilyMart. ITO EN Hojicha powder was adopted for use in a Hojicha latte to be sold at the FamilyMart counter, going on sale as the "Hojicha Latte by ITO EN" beginning December 19th at all domestic FamilyMart stores. In the first half, the company also held a premium concert for the popular folk duo "Yuzu," as well as a "Love Haiku Project" (featuring love-themed haiku printed on an "Oi Ocha Autumn Lovers" Bottle, distributed as a limited quantity, seasonal item). Both were well-received by the young generation. In addition, under the title "Oi Ocha and Onigiri (Rice ball) Action," the company joined the "Onigiri Action 2017" campaign implemented by TABLE FOR TWO, which is working to resolve world hunger and health problems through food. Barley Tea leaf product market remained unchanged, but ITO EN possesses a 42% share of the tea leaf market and a 47% share of the growing Barley Tea beverage market. ITO EN's "Kenko Mineral Mugicha" (Healthy mineral barley tea) held the number one position among all types of non-caffeinated tea beverages in 2016 (Jan. to-Dec. 2016, data by ITO EN). The company has developed Barley Tea tea bags containing minerals and are working on opening up a new market for them (RTD Barley Tea traditionally contain minerals). In order to fight the heat in spring and summer, and stay hydrated in fall and winter, ITO EN proposes year-round mineral supplementation. The vegetable 100% beverage market, of which ITO EN has 38% of the market share, is expected to grow by more than 10% each year from 2015-2017 and will likely be driven by tomato juice, which reportedly have the effect of lowering blood sugar. ITO EN has succeeded in capturing demand with the "Riso-no-Tomato" (Tomato Juice) and "Aojiru" (Green Juice), in addition to the well-performing "Ichinichibun-no-Yasai" (One Day Veggie). Until now, it has focused on sweetened Aojiru, but the sugar-free market is expanding, and ITO EN is increasing sales in both the drink and powder categories. For Coffee Beverage, the market for the traditional-sized short cans (126-200ml) has been shrinking, while the market for 201-599ml cans, pioneered by ITO EN through "TULLY'S COFFEE" is growing. Recently, the most notable growth is in the 500ml PET bottle market. ITO EN also offers "TULLY'S COFFEE Smooth black MEDIUM," which is sold in a microwave-safe PET bottle so it can be reheated. Next spring, the company is planning to invest in two new bottles for black and latte coffee. In addition, the company strengthened its link with Distant Lands Trading Co. (on the outskirts of Seattle, Washington; hereinafter DLTC), which manufactures and sells coffee and coffee beans for subsidiary Tully's Coffee Japan Co., Ltd.; and will work on building a supply chain all the way from green tea and plantations to finished products. DLTC also handles private brands such as general merchandise stores (GMS) and wholesales to food-service establishments using coffee beans harvested from company-managed plantations. Going forward, it will strive to improve quality and its brand both in Japan and overseas by building a supply chain from plantations to products. The tea market (tea beverages, tea leaves, green tea leaves), including black tea, is spreading worldwide, and grew 34% from 2011 to 2016. In particular, there is a lot of room for growth in the sugar-free and high added value green tea markets, and ITO EN is continuing to expand globally with emphasis on the US and Chinese markets. In the first half, "Global Tea Bags" sales rose 76% year on year in the US, and 93% in China compared to the second half of the previous fiscal year, when sales began. Sales for the "Oi Ocha" (RTD Green Tea) also increased by 12% and 27%, respectively. The company is also intensifying expansion to airports in order to attract customers from inbound flights, and its shop is currently located at four airports: Haneda (saryo ITO EN), Narita (FaSola ITO EN), New Chitose (TAX FREE ITO EN), and Fukuoka (GIFT SHOP ITO EN). At Haneda airport, in addition to "saryou ITO EN" in the International Terminal, the company opened a Tully's Coffee shop on the Arrivals floor this summer (which is performing well and ranks in the top five of domestic Tully's Coffee stores). Furthermore, it ran an exhibit during the Attended 1st "JAPAN's FOOD" EXPORT FAIR (Oct. 11-13, 2017) held at the Makuhari Messe convention center in Chiba Prefecture, with the goal of raising global awareness and negotiating with buyers from many countries. In August, the long-lasting typhoon Noru (which lasted for the third longest period since the start of statistical surveys) hit Japan, the duration of sunshine in Tokyo was the shortest in history, and it rained for 21 consecutive days in Tokyo (36 days in Sendai). As a result, the sales volume of beverages in Japan decreased 5% year on year. In October, two typhoons (Lan and Saola) hit Japan in two weeks, making all Saturdays in Tokyo rainy and causing the largest rainfall amount in western Japan since the start of statistical surveys in 1946. As a result, the sales volume of beverages in Japan declined 4% year on year (according to the reference material of ITO EN). Under this business environment, the company needs to conduct inventory adjustment due to the augmentation of sales promotion cost. Accordingly, it was forecasted that profit would drop considerably because the burden of fixed cost and sales promotion cost would increase due to the sluggish sales in the first half of the term ending Apr. 2018, but sales and operating income grew 3.0% and 1.2%, respectively, year on year. Behind this, there is a company-wide sense of crisis as its market share dropped in 2016. Spending nearly half a year, the company brushed up "Oi Ocha," including the container, and renewed it in May. Thanks to the effect of the renewal and sales promotion enhanced with a sense of crisis, the company produced good results while the entire industry was stagnant. This result indicates how competent the market leader is. We are looking forward to seeing the performance of "Hojicha" (roasted green tea). This is because major beverage manufacturers are preparing for the entry to this field. The green tea market is promising, but competitions are fierce, because major beverage manufacturers put a great deal of effort. While the market has expanded through the activities of major beverage manufacturers, the market leader ITO EN decreased its market share temporarily, but recovered it, receiving benefit from the market expansion. In the field of Hojicha (roasted green tea), too, the brand is spreading, as ITO EN handles products in various categories, including tea leaves, RTD, and powdered products. In the term ended Apr. 2012, the ITO EN Group developed a CSR system that conforms to the "ISO 26000" guidelines on organizational social responsibility. In "ISO 26000", there are 7 core subjects: "organizational governance", "human rights", "labor practices", "fair operating practices", "the environment", "consumer issues", and "community involvement and development" (community issues). In order to create shared values (CSV: Creating Shared Value), the company promotes a "CSR/CSV" management style that aims to solve "the environment", "the consumer issues" and "the community issues" for itself and for the society. For example, the tea-producing regions development project contributes to local revitalization, creation of jobs, and stable management of producers, while producing a steady procurement of high quality tea leaves. This is ITO EN's representative CSV activity for addressing the community issues mentioned in ISO26000. In relation to SDGs, the company understands that these activities also contribute to the goals regarding "sustainable consumption and production", "sustainable agriculture", and "sustainable community development". While engaging in human resource development and coming up with ways to enable employees and the local community to learn sustainability together, ITO EN uses its core business to promote activities such as local revitalization, which is a social issue, and the legacy-creating international "Sports Years" cultural programs. These efforts have resulted in a higher evaluation from outside the company. For example, in addition to receiving the "Porter Award" in 2013 for competitive strategy, the Project of the Developing Green Tea-Producing Regions received the "Minister of Agriculture, Forestry, and Fisheries' Food Industry's Excellent Company Award" in 2015, and received a "Grand Prize" and the "Minister of Economy, Trade and Industry`s award" for the "Fifth Platinum Grand Prize" in 2017. The new environmentally conscious aluminum free paper drink containers, which are recyclable and can be distributed at room temperature, won the "Minister of the Environment's Global Environment Award". CSR activities also won the "Minister of Economy, Trade, and Industry's Japan Water Award". Awards like these and evaluations of ITO EN's contribution to the creation of a sustainable society are rapidly increasing its number. For the purpose of contributing to the improvement of medium to long-term corporate value of the ITO EN group from the viewpoint of cementing the relations with business partners, etc., our company may acquire and hold the shares, etc. of business partners, and will not hold shares for which the meaning or rationality of shareholding cannot be recognized. Copyright (C) 2018 Investment Bridge Co., Ltd. All Rights Reserved.